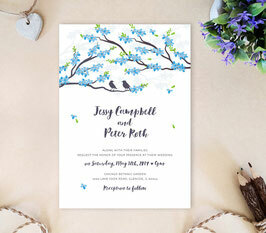 What better way to tell your family and friends about your soon-to-be nuptials than with our Spring Wedding Invitations. Showcasing blooming sakura trees and sweet lovebirds, our spring invites will perfectly deliver the details of your wedding. Each of our springtime invitations are printed on premium cardstock for a high-end finish..